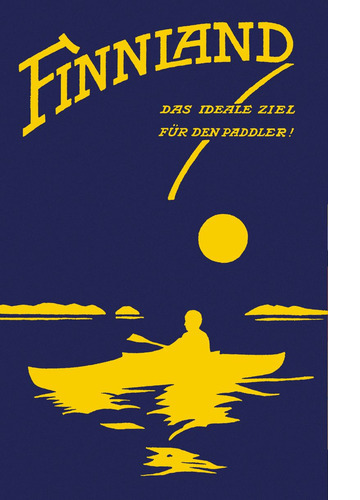 As early as 1915, the chairman of the Finnish Tourist Society thought it was high time to brush the dust off the old canoe and head off to exlore Finland. However, it was only at the end of the 1920s that promotional efforts were directed at foreigners and brochures and posters started to proclaim the endless possibilities that Finland could offer and still can offer. 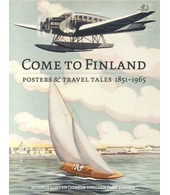 Most of the attention was directed towards England and Germany where there seemed to be a lot of interest in Finland. What were the Finnish calling cards? Silence, the great expanses, the thousand lakes, and the unspoiled nature. In other words the usual suspects. ‘We live in the hope that these camping routes will one day span the entire nation, so if one wishes one can pleasure wander from north to south and east to west,’ said Wolter Stenbäck, director of the Tourist Society in an interview from 1935. The artist behind this harmonious motif is the German born Arnold Neumann who among other things was the director of the advertising deartment at the Finland Steamship Comany and one of the big architects of the foreign tourist boom in Finland at the end of the 1930s. territories for Finland. 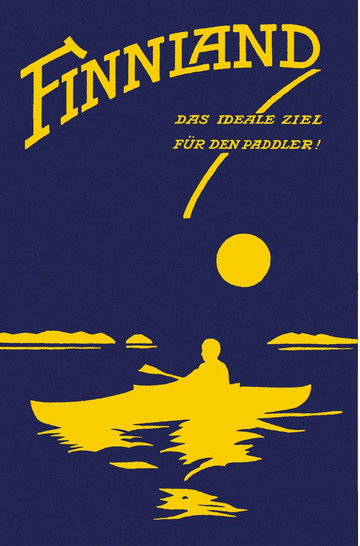 Canoeing was his great assion and thanks to his brochures and handbooks which he himself both wrote and illustrated ‘our waterways started to be inhabited by foreign canoeists’ as someone described in an ode written to him on his 50th birthday in 1945.